What Does Your Entrance Say About You? The entrance is your opportunity to offer a good first impression and sets the tone for the entire space. In the world of business vernacular, the approach is your marketing brochure and broadcasts your brand to others. Because the entrance is so important, it makes sense to pay attention to it. The experience you and others have coming in will be “carried” into the space. In addition, the experience others have passing your space is also important. Ideally, your front elevation produces a pleasant experience for neighbors, visitors and even those dreaded solicitors! Give your visitors something to enjoy like pleasant sounds and interesting things to experience. 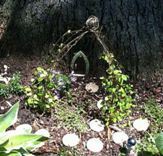 For example, our home has a fairy garden near the front door. The miniature plants and accessories are whimsical and magical. Tapping into the wonder of the world is important to me and I’ve stated that by the location of our fairy garden. 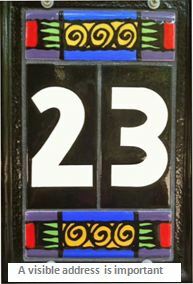 Use a unique color on the front door harmonious with your home's exterior color scheme. To give the front door more oomph, make the trim, shutters, eaves, garage and other doors recede. Invite welcome with pleasant sounds like chimes and fountains. Repair uneven steps, sidewalks, and broken concrete. Offer safe illumination of walkways, steps and entrance doors. Trim hazardous tree branches and obstructive shrubs and bushes. Make sure the address is clearly visible from the street. Ensure doors open completely and lights, door bells, knobs and locks are in good working order. Add symbols of welcome with statues, garden art and accents. Use vibrant colors with plants and flowers. Balance extreme yang elements with curves, shade and textures. Balance extreme yin elements with movement, straight lines, and brightness. Keep the approach clean and trimmed. The effort spent creating a healthy, vibrant and pleasant experience for yourself and others comes back to you. Make it good!